Screenshot courtesy of U.S. News and World Report. 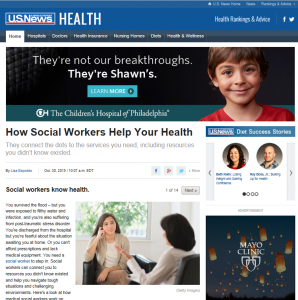 Cheers to U.S. News and World Report reporter Lisa Esposito for doing this slide show article on how social workers help people stay healthy. Esposito tapped National Association of Social Workers (NASW) Senior Practice Associate Carrie Dorn, NASW member Lorette Lavine in Chicago, and other social workers to make this informative report. NASW hopes social workers will use it to educate the public about the important role the profession plays in the nation’s health care system. Want to learn more about social workers in health care? Visit the National Association of Social Workers’ “Help Starts Here” Health and Wellness website.